Excellent used condition. Full Zipper snd zippered pockets and mock neck. Ralph Lauren Women’s Size M Pink White Striped Cotton Pullover Sweater *MINT*. Condition is Pre-owned. Shipped with USPS First Class Package. This V-neck sweater is knit from light weightextra-fine soft COTTON. 100% Cotton. Hand Wash Cold. Shoulder Width : 15". Pre-owned but in excellent condition. V NECK TO HEM- 16". SHOULDER TO SLEEVE" 101/2". WOMENS RALPH LAUREN KNIT SWEATER XS Purple Buckle Shoulders Stretch 100% Cotton. Good Condition Has discoloration on the right sleeve. Please see pictures armpit to armpit 16” length 22” Shipped with USPS First Class Package. Ralph Lauren Puple Sweater Women’s Medium. In perfect condition! Great cardigan with a gun patch. This sweater is in very good condition. Top of Shoulder to Bottom of Shirt : 23 in. Top of Shoulder to Bottom of Sleeve: 23 in. Material: 100% Cotton. Ralph Lauren Polo Women's Cable Knit Red Sweater Size S. Condition is Pre-owned, like new. Shipped with USPS Priority Mail in USA only. Thanks for looking! 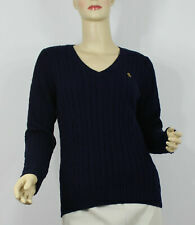 A beautiful, best quality pullover sweater from Lauren by Ralph Lauren. 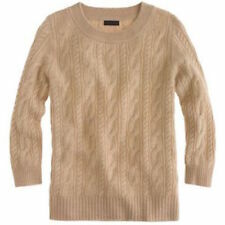 The color is pale ivory with a v-neckline and the texture is cable knit (this is not a heavy sweater). The length is 24". All Ralph Lauren logos and labels are intact including an outside embroidered initial logo on the upper front. This Ralph Lauren ivory linen/viscose long cardigan is a great bargain because it has one flaw that's difficult to see in the folds of the sweater. It's a horizontal thread on the lower back. See: photo #3. RALPH LAUREN CABLE KNIT CARDIGAN DUSTY ROSE, SHAWL COLLAR, HORN LOGO BUTTONS, LONG SLEEVES, POCKETS, COTTON BLEND. LONG 26", BUST 32", SLEEVES 24". Woman,s, Ralph Lauren, NWOT, Size L, Red & Black, RLL Crest Insignia, Silver RLL Button, Cable Knit, Cotton, Cardigan, Sweater. Silver RLL Buttons on Front Closure. Black Stripe on Collar. Has Lots of Extra Stretch. Ralph Lauren Womens Cable Knit Pullover Crewneck Sweater Blue Size Large L CONDITION: Preowned - Good Used Condition MEASUREMENTS: • Pit to Pit: 19"
• Top to Bottom: 25"
• Shoulder to Cuff: 26" MATERIALS: 100% Cotton Please Note That The Colors Of The Item May Show Differently From Display To Display And I Cannot Guarantee That The Col ors Will Show Accurately On Every Display. 26" from back of neck to bottom of shirt. 27" from side of neck to bottom of sleeve (3/4 sleeve style). 29" across chest lying flat (armpit to armpit). VINTAGE RALPH LAUREN POLO USA FLAG Sweater [SZ M]. Condition is Pre-owned. Shipped with USPS Priority Mail. Shoulder (shoulder to shoulder): 14.5. Chest (armpit to armpit): 17. Sleeve (shoulder to cuff): 18.5. Length (top of the collar to hem): 23. ANY IMPERFECTIONS WE WILL NOTE IN OUR PICTURES. THE SWEATER HAS. THE SWEATER IS IN VERY GOOD CONDITION ! THE COLOR IS PURPLE. We try to list any other details in the condition section. HIGH END CLOTHING ATROCK BOTTOM PRICES! 100 % AUTHENTIC OR ALL OF YOUR MONEY BACK! Great comfy (No itch) sweater with more of a relaxed turtleneck. 55% Cotton; 22% Viscose; 20% Nylon; 3% Other ; Hand wash cold; lay flat to dry. Overall length 25". Underarm to underarm 20". This sweater is in great pre-owned condition with no flaws noted. Hand wash, lay flat to dry. Size Large. Length: 25" (from base of collar to hem). Chest: 18". 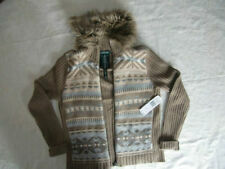 RALPH LAUREN SPORT OFF WHITE CARDIGAN, SHAWL COLLAR, LONG SLEEVES, MOTHER OF PEARL BUTTONS, CABLE KNIT 100% COTTON. LENGTH 22", BUST 33", SLEEVES 25". PERFECT CONDITION! 9/10 Flawless Vintage Ralph Lauren Polo Black Turtle Neck Shirt Size L Small RL Flag. Shipped with USPS First Class Package. Women’s Ralph Lauren Polo Sweater White Cable Knit Crewneck Size Medium. Condition is Pre-owned. Shipped with USPS Priority Mail. Great sweater. Gently used. Classic look. Smoke/pet free home. 36 in across the chest armhole to armhole laying flat. 32 in long. Always amazing deals on beautiful, comfortable bohemian inspired clothing,shoes and accessories. Classic and stylish Ralph Lauren Sport 100% cotton. Neck pullover in pink and white stripe. 100% Pima Cotton. POLO GOLF RALPH LAUREN. Navy Long Sleeve Yellow Trim Sweater. THIS WILL HELP. 22 - Back neckline to hem. 18 - Shoulder seam to end of arm. Lauren Ralph Lauren. Full Zip Sweater. 26" Length. Condition is Pre-owned. No stains or holes. 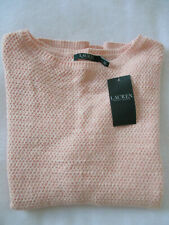 Women's Ralph Lauren Pink Acrylic Knit Sweater, Size Medium/Excellent Condition. Condition is Pre-owned. Shipped with USPS Priority Mail. Woman,s, Ralph Lauren, Size M, Light Gray, 2 Pc. Pearl Buttons on Front Closure. Has Lots of Extra Stretch. Hand Washable. In Excellent Condition. Shoulder; Top12.5" Cardigan; 15". Length: 23" ( back collar to bottom hem ). 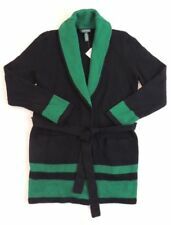 Cardigan double breasted with black buttons. Ralph Lauren. White - thicker cotton. Approx 18" armpit to armpit. 100% Cotton. 3X Ralph 61% cotton warm but light weight wrap, looks great lint pills can be shaved. Hidden button close to cross sweater, see pics I tightened. Great car sweater. Condition is Pre-owned. Shipped with USPS Priority Mail.